What Do I Eat To Lose Fat? Fat-loss nutrition is one of the most important and also one of the most confusing aspects of an overall plan to lose weight. Our goal here is to simplify it for you, so you know exactly what you're doing and finally answer the question "What do I eat to lose fat?" What are Good Fats and Bad Fats? How Much Fat Should I Eat? Is Calorie-Counting Necessary for Fat Loss? Is the Atkins Diet Good For Fat Loss? What Are Non-Impact Carbs, Net Carbs and Effective Carbs? Is the Glycemic Diet Good For Fat Loss? 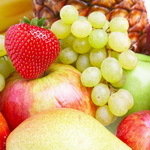 Will Eating Fruit Make You Fat? Imagine the promise of low-carb foods wrapped up in traditionally "high-carb" packages. It sounds like a dream come true to dieters who crave the taste of carb-containing foods (like chocolate) but still want the results of a low-carb diet. Is this for real or are these terms just designed to pry open your wallet? Over the last 30 years, research into food and blood glucose response has completely changed our carbohydrate classification system. 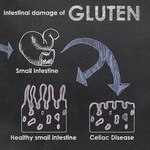 This response to carbohydrates is known as the Glycemic Index (GI)...and once you know what it is, you can USE it to your advantage for losing fat. With the popularity of the Atkins/Low Carb diet fading rapidly, it was only a matter of time before the next "big thing" came along to replace it. The premise of the Glycemic Diet is simple: carbs are not the bad guys...it's the TYPES of carbs you eat that are most important. The big question is, does it work? Let's face it, though...bread is delicious, and who could say "NO" to a freshly made bagel, right from the oven. They're very hard to resist. 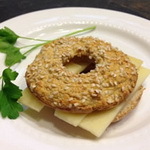 Here is a healthy version of everybody's beloved bagel...gluten-free and dairy-free. And now we can enjoy them GUILT-free. I don't know any reasonable person around the world that doesn't LOVE bread. 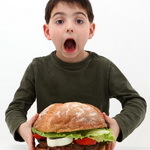 However, bread seems to be the culprit that can very easily derail your fat-loss success . 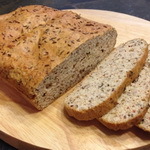 We've fixed that with this delicious recipe for gluten-free, grain-free bread.